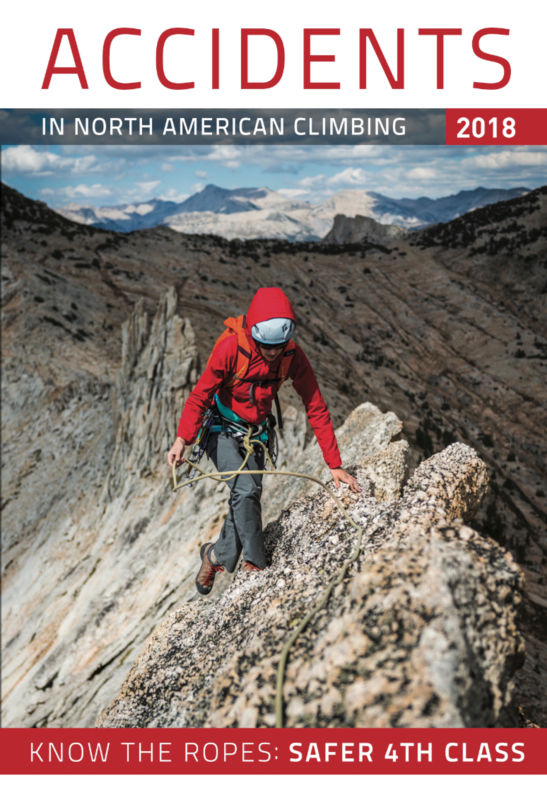 Editor's note - Accidents in North American Climbing (ANAC) is an annual compendium of climbing accident reports in the United States and Canada. Since 1948, the American and Canadian Alpine Clubs have provided an annual summary of the year’s most significant and teachable climbing accidents. The Alpine Club of Canada started contributing material in 1977. In an effort to promote safe climbing and practices we compiled six reports from the 2018 ANAC, featuring accidents that have occurred in Canada across three main themes. To read the full analysis and report for each story, click on the titles - let’s stay safe out there! “Two rockfall incidents on the popular east rige of Temple resulted in injuries and evacuations. On July 30, a party of three high on the route had just made the long traverse left across loose ledges to gain gullies through the Black Towers. Route-finding can be difficult in this area, and this party began ascending the wrong gully. After one pitch, the leader realized he was off route and started to rappel back down. He dislodged a large rock that struck the head of one of the other climbers, cracking the helmet and causing a concussion. The team was able to retreat back across the ledge to a high point on the ridge, from which they were evacuated. “June 18 was a busy day at the Back of the Lake. We were a group of seven; everyone knew each other, but not everyone had climbed together. Everyone was a physically strong climber, which may have led to a sense of complacency. Several of the climbers decided to link Public Enemy into Bloodsport (5.11-) after seeing another party do the same. The other party said the combined pitches totaled 43 meters, but their 80-meter rope “did the trick” for lowering, with stretch. Person 1, one of our group members, said his rope was 80 meters. Person 1 linked the two pitches and attempted to lower to the ground. Person 2, lowering Person 1 with his Grigri, was looking up at Person 1 when the rope pulled through the belay device. There was no knot, and the rope was not 80 meters. It was 70 meters. "Two climbers were attempting the west ridge of Chancellor Peak (3,266 meters) on July 24. They were expecting low fifth-class climbing and instead encountered what felt like 5.8 or 5.9, with little protection, on poor rock. The two simul-climbed an estimated 10 to 12 pitches along the ridge until they got to a steep section they could not safely climb. Their route description told them to look for a rightward traverse, but they could not find it. While looking for the correct path, they triggered a large rockfall, which unsettled them and made them feel they could not safely ascend or descend the route. They called Banff dispatch on their cell phone and requested a rescue. Both climbers were uninjured. “There were four separate rescues of uninjured but stranded groups of climbers on the Rundle Traverse in the summer of 2017. This 18-kilometer (11-mile) traverse follows a ridge across the many summits of Mt. Rundle. The terrain is mostly scrambling, which increases in difficulty from east to west in both route-finding and technical climbing (low fifth class). It is usually done in one very long day. ANAC welcomes first-person reports about technical climbing accidents, as well as reports and analysis from rescuers, rangers, and other individuals familiar with the incidents. The person(s) involved may choose to remain anonymous. The American Alpine Journal's online Submission Form collects all the necessary information.